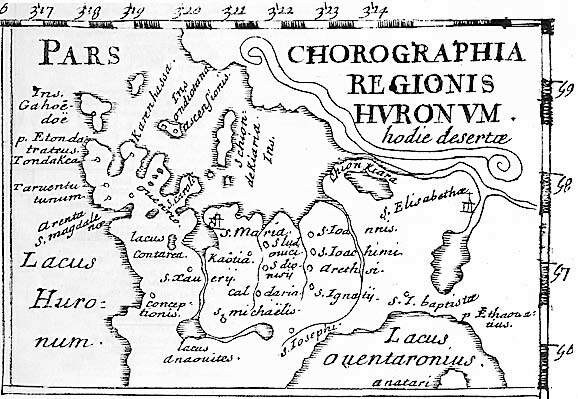 Huronia Chapter - Ontario Archaeological Society: Carhagouha - Do we know where it is? I received a letter from Rev. Bernard Carroll, S.J., the director of the Martyrs' Shrine, in which he asked about Carhagouha "As successors to those first missionaries, we present-day Jesuits are very interested (from a Catholic perspective) in finding the actual Carhagouha site where the first recorded Mass took place and at which Champlain was likely present. Finding conclusive evidence would be, I am sure, a challenging task." 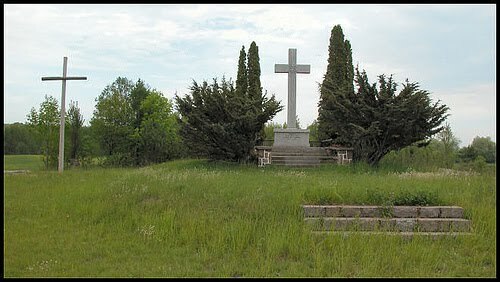 It has been long assumed by local residence and tourists alike that Carhagouha (the site of the first recorded Mass in Ontario according to Champlain's journals) is located in a field marked by a couple of crosses northwest of the village of Lafontaine in Tiny township. (if you search this blog you will find at least 4 additional posts regarding Carhagouha). Is this the actual site of the Huron/Wendat village visited by Champlain in August 1615? What evidence is there to support the claim made by A E Jones, S.J. in his book "Old Huronia" (1908) that this village was on lot 20 con 17 of Tiny township where this site now marked as above? It is my hope to explore these questions and others related to this subject at our next Huronia Chapter meeting at the Huronia Museum Thursday March 8th starting at 7PM. Hopefully we can move to vindicate this site as the correct location or find suitable new candidates for the location of this historically significant village.